The general consensus is to avoid the Razer Forge. While it is an official Android TV product, it lacks support from Razer and companies like Netflix have blocked installing on them (no one knows why, but it's most likely a decision from Netflix and not Razer). The hardware itself is not bad, but there is little to make it stand out from alternatives such as the Nexus Player, Shield TV, and even the Amazon Fire TV. 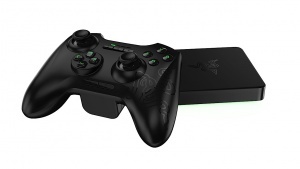 Razer Forge TV uses the "ARM" version of Kodi for Android. Assumed? : You first need to enable developer options to activate Android Debug Bridge (adb) debugging and allow unknown sources before you can side-load latest beta or nightly version of Kodi for x86 (not ARM). 1. Scroll down and click on Settings. 2. Scroll down and click on About. 3. Scroll down a last time to Build Number. Tap on build number repeatedly (should be about 7 times) until a bubble appears saying you’ve unlocked the developer options. 1. Return to the Settings menu using the steps above. 2. Scroll down to the bottom and you’ll see the Developer options. 3. Open Developer options and ADB debugging should be the third option. Enable it. 2. Under the Preferences section, scroll to the right to find the Developer options. 3. Open Developer options and then Debugging, and USB debugging should be the first option. Enable it. 4. Connect a computer with ADB installed using a USB cable. 2. Scroll down and click on Security. 3. Enable "Unknown sources" to allow installation of apps from sources other than the Google Play store, this will allow side-loading of apps like Kodi. Download your preferred version of Kodi listed in Development builds. If using USB, run adb usb from command line / terminal. If using ADB over network, run adb start-server; adb connect <ip address of Razer Forge> from command line / terminal. Check that the device is attached correctly. Run adb devices If you see the device as "unauthorized" confirmation from the Razer Forge to trust the attached computer is needed. Finally, to install, run adb install <path to apk file> (use adb --help to see additional install options like -r that keeps app data on a reinstall). Assumed? : Because Google will currently not display side-loaded apps in its default "Leanback Launcher" you can use this "Sideload Launcher" app by Chainfire to more easily launch apps that have not been approved by Google or does otherwise not meet the declaration requirements needed for showing up on the default "Leanback Launcher" (on the Android TV homescreen) for Android TV. 2. Reboot your Razer Forge by unplugging (as it does not have a software reboot) or by entering adb reboot from command line / terminal. 3. Start the "Sideload Launcher" app and use it to launch Kodi or other third-party apps that you have side-load installed. This page was last edited on 31 August 2017, at 15:38.